Melons are one of those few crops that cannot be held in a freezer, but we are willing, and even pleased, to accept them as a transient seasonal delight. Corn we want every week, but melons somehow seem especially to be the very spirit of summer (if we actually had the ability to hold melons at peak quality for months at a time we might change our minds, but as it is we’ll accept them as a gift of summer). But while they are available, we’ll gobble them every chance we get. There are at least 19 kinds of “melon”; our favorites—and, it seems most Americans’—are what Americans call “cantaloupes” and everyone else calls “muskmelons”: the orange-fleshed melons. Outside America, “cantaloupe” refers to the Charentais-type melon, which—though it looks much like a muskmelon—is in fact a distinct type (Cucumis melo L., var. cantalupensis Naud). Some think Charentais melons are clearly the best in the world, others that they’re good, but no better than many another sort. We think it’s fun to test again every summer. In our climate—summers short with warm days and cool nights—melons are something of a challenge, though not, thank heavens, a serious one. While one wants the best possible flavor in a melon, the very first requisite is to have a melon at all. Our search thus focussed on melons widely held to be suited for “northern gardens”, which means early and very early types. But even with that restriction, plus keeping solely, as always, to open-pollinated types (as with so many vegetables these days, hybrids dominate the lists these days), there are not a few apparently excellent candidates. Noir des Carmes, orange flesh (green when immature), heirloom true cantaloupe type very highly rated by “melonistas”. Minnesota Midget, orange flesh, old reliable type (1948), very early, not quite as small as the name implies; we’ve grown it before, and it’s wonderfully delicious. Jenny Lind, small, pale-green flesh; a reliable heirloom type. Early Hanover, a good-sized muskmelon type, pale-green flesh, also heirloom. All of those are described as “early” melons, and we seem able to manage to get some of each. There are certainly many other possibilities, but those seem the most likely best-eating types possible in our climate. We need to bring all of our heat-preserving weapons to bear on melons if we are to grow them well, or at all, in this climate—but it can be done. That arsenal needs to include (besides careful cultivar selection) plastic mulches, drip irrigation, row covers, wind protection (notably important for young melon plants), starting seedlings indoors, and careful transplanting out. When planning and planting, remember that your all melons will come ready in a pretty narrow time window, and cannot easily be preserved; even if you like melon every day, be wary of overplanting. Melons can take, depending on whom you believe, anything from 60 to 85 days from transplanting to mature, and they don’t like cool weather: they are said to grow best at temperatures between 75° and 85°. Around here, the average daily high temperature dips to 75° in early to mid September, so ideally we’d like our melons to be fairly well done by then. For a 75-day melon type, which most “earlies” are said to be, that would mean transplanting out by no later than August 1st. Sigh of relief: we start seeing average daily highs of 75° and over as early as mid-June. Our peak temperatures are around July 22nd, so we can use that as the target for the mid-point of melon growth; allowing a conservative 80 days for growth, that means setting out transplants around June 12th. That way, by September 1st they will have have already had 80 days—which should be about enough—and by early to mid-September, when temperatures fall below optimum, they should surely be done. Sources do not agree exactly on how long melon plants should be incubated indoors in pots before transplant, but the lowest figure usually seen is a full month, with some going up to as much as 2 months. On the one hand, the longer we grow them indoors, the bigger the jump we get on the season; on the other hand, melons are finicky about transplanting, and very much do not like having their roots disturbed. Still, if we use good-size peat (or cow) pots—which do not require us to undo the root system to transplant—then 6 or so weeks looks like the right amount of time. Working back from that June 15th transplant date, then, means starting our seedlings around May 4th. Since we plan to grow our seedlings indoors to a healthy size, it would be wise to grow them in at least 3" and probably better 4" pots—either peat pots or cow pots, so you can just plant the pot direct and not disturb the seedlings’ roots. It is also a good idea to slightly overplant—use three seeds per pot—then thin, culling only once the seedlings are big enough to let you know who’s who. Try to keep the seeds at a high temperature, say 80° to 90° till they germinate (heat pads help here), and in the dark. When the seedlings emerge, lower the temperature to, and then maintain it at, about 75°; to now supply light—16 hours under grow-lights of some sort—is a good idea. Be sure to not let the soil (or peat) dry out—keep it constantly moist. Applying diluted fish emulsion twice a week also helps. About a week before transplanting, start hardening off the seedlings: reduce both their water and their temperature (somewhat—not drastically!). Your melon bed should have full sun all day long. Melons prefer light, well-drained, sandy loam—they hate “wet feet” or compacted soil. Prepare your melon bed by digging well and deep, incorporating generous amounts of organic material as you go, for melons need rich soil. The pH wants to be a bit lower than the usual 6.8—somewhere between 6.0 and 6.7, but even a little lower will not hurt them (watermelons can tolerate as low as 5.0). Another thing your melon bed needs is at least some protection from wind, for young melon plants are easily harmed by brisk winds. You might grow a row of some fast-growing stalky plant—grain, for instance—somewhat to the windward of your melon bed, timing the planting to produce good growth by melon-transplant time; or you can consstruct some sort of mechanical windbreak. Don’t place a windbreak too close. Maximum benefit occurs at about 5 times the average height of the break; above 10 times, or below 2 times that height, there is little or no protection. Also, a windbreak that allows some air to pass through, like a picket fence (or a stand of grain) works better than a solid barrier of any sort. For a grain barrier, winter wheat varieties, rye, or oats make good breaks—or spring barley for February plantings; sow thickly, 2-3 seeds per inch. About two weeks before you expect to actually set the transplants out, lay down your drip lines, then cover the bed with plastic mulch (or vice-versa, as you prefer). You can use black plastic, the new IRT (Infra-Red Transmitting), or colored plastic—black is usual, but there’s a lot of research going on with newer types. “Seal” the edges of the plastic by tucking them into the soil (or in any other clever way that occurs to you). Nowadays the most-recommended plastic mulch for melons is green infra-red transmitting plastic. It’s time to transplant, no matter what the calendar says, when your seedlings have two or three true leaves (some say as soon as the second leaf shows). Plant your seedlings out through the usual X-shaped cuts in the mulch. Try to make the cuts as small as possible, and only make them just as you’re transplanting—that way, the mulch will better warm the soil both before and after transplanting. Be sure not to bare or joggle the plants’ root systems when transplanting. They do not like such treatment, and will punish you for it. If you’ve used peat or cow pots for your seedlings, just plant the whole pot. In a deep-dug bed, space plants at about 15 inches. If you are using peat or cow pots, while you can just plant the whole pot, do be sure there is no rim extending above the soil level, because that will act as a wick to draw moisture from the plant; either trim the pot rim down flush with its soil contents or top up the soil to the brim (and slightly bury that brim). Water your transplants thoroughly to give them a good start in their new home. Immediately after, cover the plants with some sort of row-cover material (spun polyester has been recommended), for both warmth and insect protection. Keep a close eye on your young melon plants if the weather is warm: if they are showing signs of overheating (such as wilting), peel back the row cover. You can probably remove it for good, even if the plants haven’t set fruit yet, when daily highs settle down to at least the high 70s. Watering melons is a distinctly two-stage process. At the outset, in early summer, while they’re into their vegetative-growth phase, they need regular watering—though not to excess— which is why a drip system is so important. (Check the soil: with plastic mulch, the soil should retain moisture well, so don’t waterlog them.) Now: once the first fruit ripens on a plant, cut off its water, completely. Only if the plant looks positively wretched and shrivelling (a condition it shouldn’t get to with that mulch) should you supply any modest further water. Fail in this and the resulting melons will be bland and not sweet at all. If you mulch with plastic, fine; but if not, look closely at the melon photograph atop this page and you will see a small plastic triangle under the melon—melons should be kept out of direct contact with soil, lest they molder or otherwise get moisture-damaged. Even on plastic, it is wise to keep melons off the surface, so that if it rains they don’t sit in water; things like plastic coffee-can lids work. Be alert to changes in a melon’s skin color as it approaches maturity. The primary color of the fruit will often change from greenish to yellowish. For watermelons, check the ground spot on the fruit’s belly to see if it has turned creamy or yellow. In some types, look for a slip, or crack, that will appear where the stem meets the fruit. Some slips encircle the stem partially (a half slip) or completely (a full slip). Give a gentle tug. If the melon separates easily from the vine, it’s ready. But not all melons separate easily when ripe. Watch for softening at the blossom end of the fruit. Give a sniff. Fragrance is a reliable indicator of ripeness for muskmelons and cantaloupes. Check on the particular cultivars you may choose to grow to see if they are the sort that separate easily at the ripe stage. Muskmelons & Watermelons: an really fine, in-depth site from Iowa State U.
C. melo cantaloupensis (true cantaloupes) are not commonly grown in the U.S.A.; they have deeply grooved fruit with a hard, warty or scaly rind, and orange or green flesh. C. melo reticulatus are the netted, aromatic muskmelons, and Persian melons. 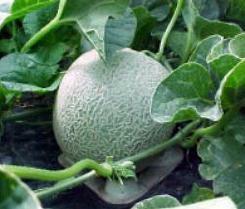 C. melo inodorous includes casabas, crenshaws, honeydews, and the late-maturing winter melons. C. melo flexuosus is the “snake” melon. C. melo conomon is the Oriental pickling melon. C. melo agrestis is the “wild melon”. C. melo chito is the “orange melon”. C. melo momordica is the “snap” melon. Melons are of the family Cucurbitaceae, which includes their close cousins, cucumbers (in fact, some vegetables grown as "cucumbers" are really melons), as well as squashes of all sorts (including pumpkins), and of course watermelons. We try not to reinvent the wheel: there is already a lengthy and detailed history of melons available on line (though it focusses on muskmelons, the American “cantelope”). Although we say “melon can't be frozen”, of course it can—but only as chunks, in a heavy syrup, like any frozen sweet fruit; and that, we think, rather misses the point of melons. You loaded this page on Friday, 19 April 2019, at 17:04 EDT. It was last modified on Thursday, 31 January 2019, at 04:22 EST.